You would never believe me if I said that a pressure washer is the solution to all your home improvement cleanliness projects. Well, that is exactly what I am saying. With a pressure washer and a moderate surface cleaning solution or detergent there is nothing that you cannot achieve. Cleaning furniture, glass and your grill is all fine. So is cleaning a car or truck easy with a pressure washer (which we have addressed under a separate section). However, home improvement with a pressure washer is a tricky venture that requires care and attention as damage from pressure washing can cost hundreds if not thousands of dollars in repairs. In this section we address a few common problems faced by home owners that requires a lot of time. 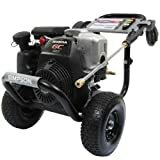 I generally use pressure washers almost everywhere but the few home improvement projects I have chosen for this category are actually the trickiest of all. Operating a pressure washer without care or with disregard for the consequences can be disastrous. Always remember that a pressure washer develops a lot of force and with the 0 degree spray tip it is easy to carve your name into any metal surface. When you use a pressure washer on the roof or with second floor walls, try to secure yourself to the flooring or use anti-skid rubber shoes. Wet surfaces can be quite slippery especially when using pressure washer. Unless otherwise stated, never rinse a surface, preparing it for application of detergent with a high pressure spray tip. Low pressure spray tip helps in wetting the surface and getting rid of loose dirt and gravel. It’s important that you try and be patient with a pressure washer. If you do not let the detergent work its magic then no amount of pressure is going to clean it. Pressure washers tend to throw a lot spray away from the intended target. We suggest that you dress in full sleeves and in full pants if you don’t like getting wet with dirty or detergent laden water. A high pressure tip works best to blast away debris, grime, stains once the detergent has done its work.